When Sen. Marco Rubio (R-FL) announced his presidential run on April 13, his speech made a point of going after ex-Secretary of State Hillary Clinton (D) -- and, in unspoken terms, former Gov. Jeb Bush (R-FL) -- as the candidates of “yesterday.” There's a clear generational gap between Rubio and Clinton and Bush: While he's 43 years old, Clinton is 67 and Bush is 62. The specter of age haunts many of the potential general election matchups in 2016. Clinton is the overwhelming frontrunner for the Democratic nomination and will be 69 years old on Nov. 8, 2016, Election Day. She is older than every person in our current Republican presidential rankings 1 except two of her fellow New Yorkers: Rep. Peter King (R), who will be 72, and former Empire State Gov. George Pataki (R), who will be 71. Table 1 lays out the ages of the candidates and compares them to Clinton. The youngest potential candidate in the field is Gov. Bobby Jindal (R-LA), who is just 13 days Rubio's junior. Both of them are more than 23 years younger than Clinton, as is Sen. Ted Cruz (R-TX), who is roughly six months older than Jindal and Rubio. Overall, with Gov. Scott Walker (R-WI) in the mix, four potential or actual Republican candidates are at least 20 years Clinton's junior. In fact, few of the biggest names on the Republican side are even close to Clinton's age. Of those who are currently viewed as legitimate contenders for the GOP nomination, Bush and Gov. John Kasich (R-OH) -- should the latter run -- come closest. Former Gov. Mike Huckabee (R-AR) is also less than 10 years younger than Clinton. Could 2016 see a record-breaking age gap between two major-party nominees? In all likelihood, no, despite the fact that, should she go on to win it all, Clinton would be the second-oldest victor in U.S. history (she would be about nine months younger than Ronald Reagan was in 1980). 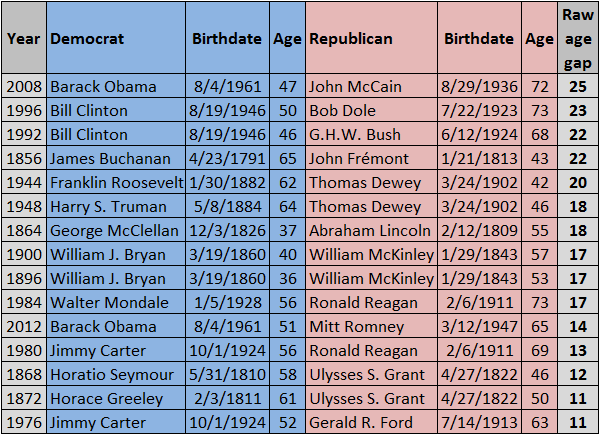 The 2008 cycle featured the largest raw age gap: President Obama was 47 years old and Sen. John McCain (R-AZ) was 72 years old, a 25-year difference (almost exactly 25 full years as both were born in August). 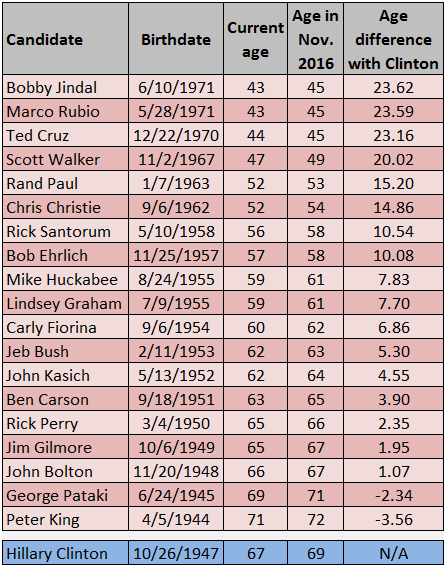 That quarter-century record span will stand if Clinton is the Democratic nominee, as Cruz, Jindal, and Rubio are only 23 years younger than her. 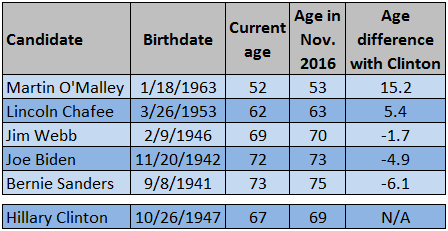 Table 2 lays out some of the biggest general election age gaps we've seen in the Democratic-Republican period. It's worth noting that, compared to the GOP field, the rest of the potential Democratic field isn't exactly a youth parade (Table 3). Of the five men we have listed beneath Clinton in our Democratic presidential ranking, only two are younger than Clinton: ex-Gov. Martin O'Malley (D-MD), who is 15 years younger, and ex-Gov. Lincoln Chafee (D-RI), who is five years her junior, and has also never run for anything as a Democrat. Then again, neither has Sen. Bernie Sanders (I-VT), who is technically an independent socialist; he's also six years older than Clinton. Vice President Joe Biden and ex-Sen. Jim Webb (D-VA) are also both older than Clinton. The age of the field stands in sharp contrast to much of the Republican field, but also to the general makeup of the Democratic Party, which over the past few elections has generally performed better among younger cohorts of voters than among older ones. Is there any pattern to age and winning the presidency? This raises a question: Is there any pattern to presidential success based on age? Despite the recent victories of younger candidates, the answer is probably no. Obviously, many questions involving presidential elections involve very small sample sizes, and this is one of them. Still, going all the way back to 1856 -- when the Republican Party took on the Democratic Party for the first time -- the older major-party candidate has won 23 of the 40 presidential contests in that time. This is a very slight point in the older candidate's favor. But what about open-seat presidential contests? This removes incumbents from the equation, who are usually four years older unless they came into office by means other than election (e.g. death or resignation). In the 16 open-seat elections for the White House since 1856, older and younger major-party candidates have split evenly, with each winning eight. Of course, this isn't a completely apples-to-apples comparison. The nature of political campaigns has changed drastically over time. Just compare 1896, when William McKinley sat on his front porch 3, to 1960, when John F. Kennedy and Richard Nixon squared off 4 on television in the first presidential debate. So perhaps in the television era, being younger has been an advantage? If we start with JFK (instead of Eisenhower, who was a two-time older winner over Adlai Stevenson), in 14 overall contests between 1960 and 2014, the younger candidate has won eight. In the five open-seat contests in that period, the younger candidate has won three: On the younger side, Kennedy won in 1960, Nixon won in 1968, and Obama won in 2008; on the older side, George H.W. Bush won in 1988 and his son, George W. Bush, won the controversial 2000 contest. (As an aside, if Jeb Bush faces Hillary Clinton, he'd be the first Bush seeking to win as the younger candidate!) An eight-six overall edge and three-two open-seat advantage for younger candidates in the TV age isn't much to write home about. And if we include Eisenhower in the TV era count, it's an eight-eight and three-three pair of draws between younger and older candidates. Should Clinton and one of the younger Republicans in the field win their respective parties' nominations, age will become an issue in the 2016 campaign, at least in context. The obvious generational difference will be an unavoidable topic, and the Republican nominee in that situation will almost certainly seek to be a “change” candidate, as many, including the current president, have sought to be before. The irony, however, is that even if Republicans choose a youthful standard bearer, it will be Clinton who receives more support from younger voters than the GOP nominee. 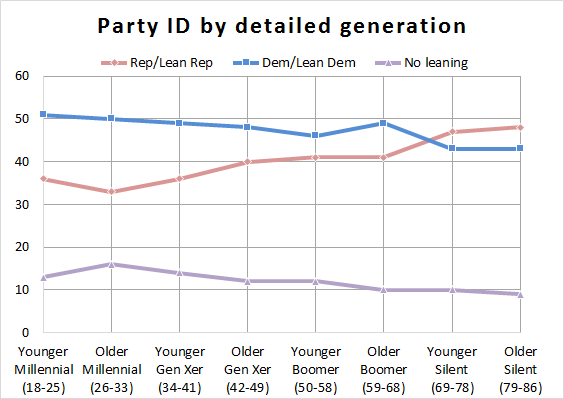 Pew recently reported its latest findings 5 on trends in party identification, and the youngest cohort of voters continues 6 to be solidly Democratic, despite some reports to the contrary 7. 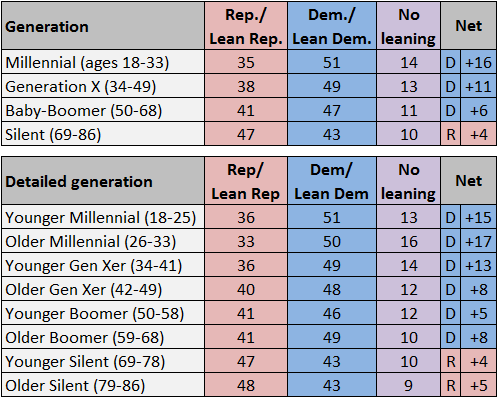 Table 4 and Figure 1 show Pew's generational party ID data, which confirm the general trend that the older the voter, the more Republican-leaning he/she is. A major explanation for this pattern is that Millennials are much more diverse than older generations and nonwhite voters tend to be strongly Democratic. Nevertheless, while Clinton may be in a position to win a majority of young voters, she will have to work to turn them out, which may prove harder 9 for her than Obama. Plus, there is the possibility that a fresh face on the Republican side could potentially cut into the Democratic edge among these voters. Considering the diversity of Millennials, the makeup of the electorate and the age-group margins could be everything. In 2012, Obama won the 18-29 year-old cohort 60%-38% over Mitt Romney. If the Republican standard bearer can reduce the Democratic advantage among young voters just a bit while performing better than Romney among older cohorts, the math could add up to a win in November 2016. Time, and the eventual GOP nominee, will tell. For the moment, what we can say with relative certainty is this: It would be foolhardy to count someone in or out in the presidential race based on age. Despite recent history, age alone won't be much of a factor in determining the 2016 result -- the candidates, their campaigns, partisanship, the economy, and the standing of the incumbent president 10 will be key to the outcome.